Yes, this is a long report, but it’s a long race. 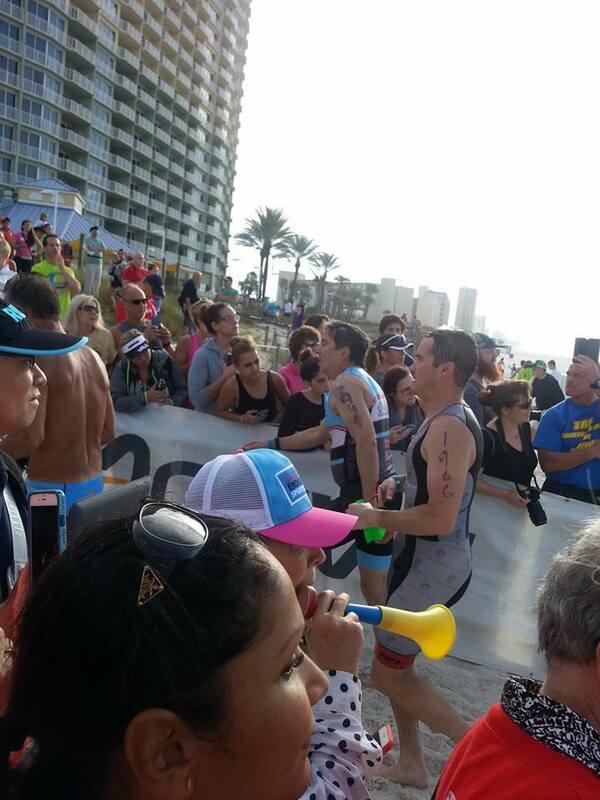 I had a great day, I never stopped smiling, and I am an Ironman. I learned that you don’t offer your time; you’re an Ironman; that's enough. Yes, it's kind of a cult, but now I'm part of it. Things could have been much, much worse. My foot issues started to clear up in October, and I could run, but it was too late to do much run training. 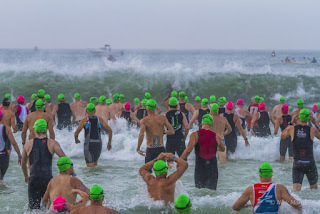 I also managed to get sick Tuesday night before the race, making my first chore in Panama City Beach Thursday morning going to an urgent care clinic to get checked out and see if there was anything they could do. I didn’t sleep well all week, not just the night before, and I think I had a slight fever the entire time. The weather wasn’t perfect – but then the next two days, the weather was terrible, so we still lucked out. But never mind the problems, or potential problems. It was great, and I had a ball. When you cross the finish line after 14-and-a-half hours, the announcer calls your name, and says, “You are an Ironman,” and for a couple minutes, you’re a rock star. 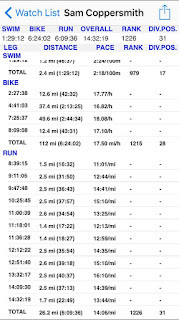 The bike course was flat, and I had to stop a few times for supplies (the Gatorade the volunteers were handing out just didn’t taste good to me, and I thought I had a mechanical but it was just a leaf stuck to my tire, making a very loud noise due to the tight clearance with the frame), but I was very pleased with my time and enjoyed the first 100 miles, singing to myself for much of the time; the last 12 miles, however, the wind shifted into our face and the songs went away. For the run, I tried to jog at the start, but got concerned that I wouldn’t have enough left for the finish – and a stiff walking pace kept me up with people my speed who were running, then walking, so I walked all but 2, maybe 3, miles and still finished ahead of my projections. I took my sweet time in transition, including a wonderful 5 minutes in a port-a-john, so there’s clearly room for improvement – if I ever do one again. For now, I’m happy with a great day. 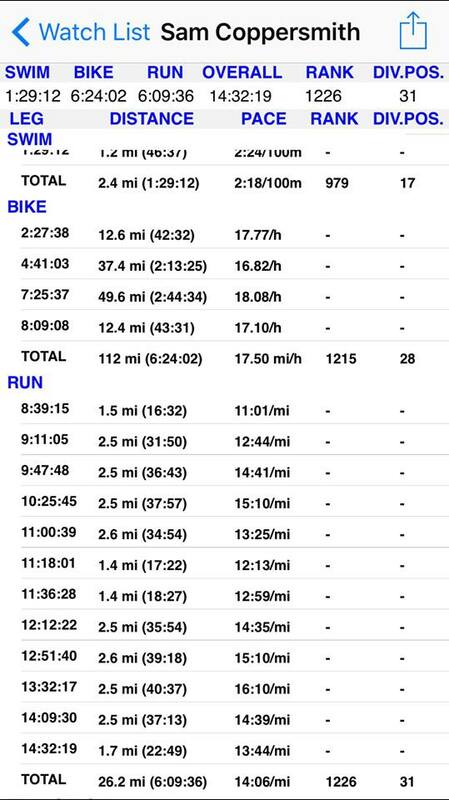 That put me overall 1174/1636 non-wetsuit; men 902/1180 non-wetsuit; 26/41 division (M60-64) non-wetsuit; overall 1566th, men 1223rd, and division 31/50 both wetsuit and non-wetsuit. 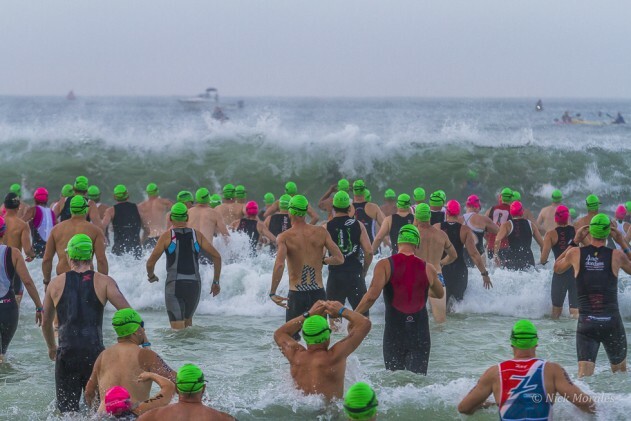 About a third of the competitors wore wetsuits, and a slightly higher percentage of non-wetsuit competitors finished: wetsuit started 782, finished 687; non-wetsuit started 1636, finished 1513. And, of course, there are pictures; and full results. 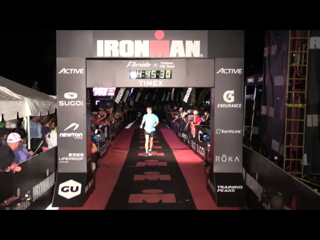 And if you go to the finish line video, and cue it up to 4:00:01, you can see me cross the line. Not that I haven’t watched it a couple of times myself. None of the other TS people said they were interested in doing another IM. I won’t for a while, but I could see signing up again in 5 years, when I graduate to M65-69. It’s good to be the youngest guy in an older guy division. 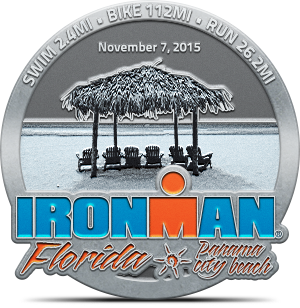 I said that when I turned 60, I would shave my beard and do an Ironman. And now I have.